Calling all BMW owners! 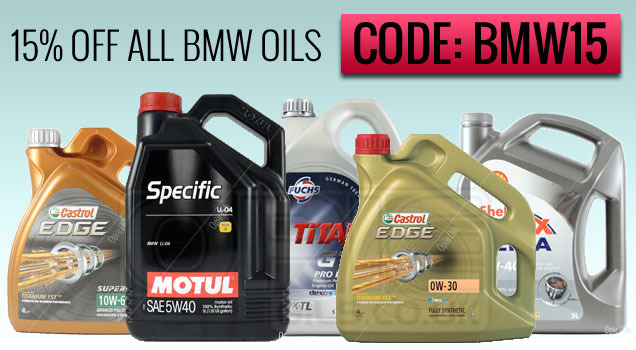 At Opies, we are currently running a great offer on all of our BMW specification engine oils, with 15% off the entire range - All you need to do is use the code BMW15. Simple! This offer covers a huge amount of top quality oils, whatever the spec you need, we've got it, and there's 15% off the lot to boot. From the ever popular Castrol Edge Titanium 0w-30 FST and Mobil 1 ESP 5w-30, to the highly reviewed Fuchs Titan GT1 XTL 5w-40 and great value Gulf Formula ULE 5w-30, there are some fantastic deals to be snapped up. - BMW Longlife 01 Engine Oil: For all BMW vehicles from 2001 until 2003. Can also be used in place of Longlife-98 and Spezial. - BMW Longlife 04 Engine Oil: Required for petrol and diesel engine BMWs with soot filters (diesel particulate filters) from 2004 onwards. It's also backwards compatible. - BMW Longlife 12 Engine Oil: A specialist engine oil for Nx7K1, Nx7U1 & Nx7O1 petrol and diesel motors from 2013. - BMW Longlife 98 Engine Oil: For all BMW vehicles from 1998 to 2000. Can also be used in place of oils meeting the BMW Spezial specification. - BMW Original Approved Engine Oil: Oils which meet the original BMW Approval are listed here. - BMW Spezial Engine Oil: An "old" BMW engine oil specification pre-dating the longlife oil specifications. Suitable for BMW vehicles manufactured from 1992 until 1997. Did you know that there's much more to Opies than just oil? We also stock a huge range of servicing essentials and engine parts including spark plugs, wiper blades and filters, to MAF sensors, alternators and air conditioning parts. All of these vehicle specific parts can be found with our handy look up guide HERE. We even sell turbochargers! If you are unsure of what oil your BMW requires, or if you've got something a bit special that requires a bespoke recommendation, then you can always give us a call. We're on the phones and emails Monday to Friday 8:30 - 5:30 on 01209 202 944 and sales@opieoils.co.uk. We can provide free and impartial advice that is geared around the level of modification and the type of use that your vehicle is getting. From gearbox and differential oils to brake fluids, we've got you covered. One last time, that code is BMW15 and is running for a limited time only, so get those orders in ASAP to take advantage of it! Just to make you aware, this offer will be ending midday on Wednesday 1st February. So, if any of you are looking to get stocked up on your BMW spec oils, you'll want to get those orders in before this date, especially whilst the free shipping on orders over £40 offer is still running. You'll also have the opportunity to sign up to our emails to be the first to find out about our competitions and new products on the same page. We'd hate for you to miss out!